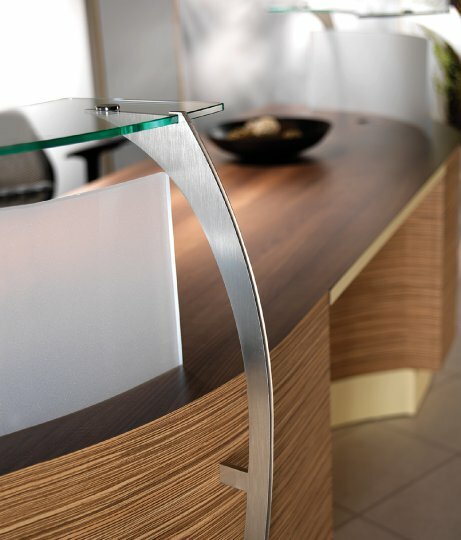 Evolution reception desks are available in a comprehensive selection of curved and straight reception desks. There are three options of counter or upstand to choose from. Firstly and acrylic curved shelf, secondly an acrylic upstand with a wooden shelf and thirdly, a glass shelf supported by stylish "shark fin" metal shelf supports with a central acrylic upstand. Reception desks and reception areas are one, if not the most important area within any office. The main reason for this is that it is the first point of call for any new visitor, client or potential client. This means that the first impressions of your company will be made here. Whilst making sure that you welcome your vistors properly, if your reception area looks worn and dated or doesn't reflect the company the way you want can be a larger negative than you originally may think. 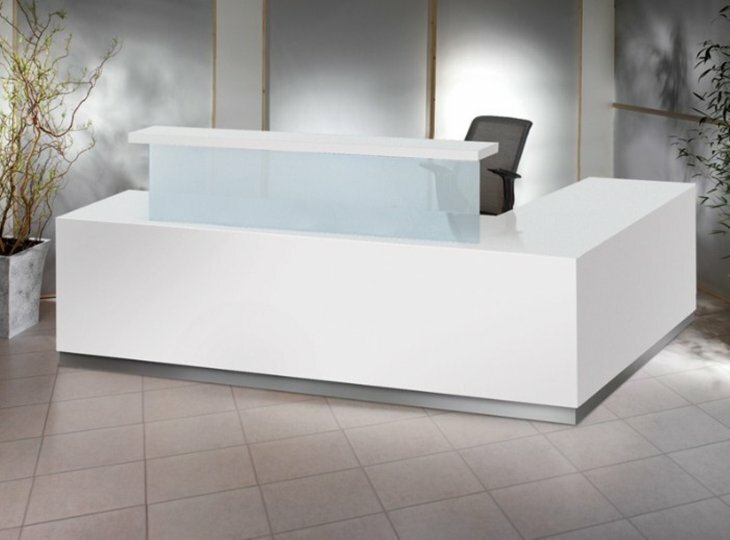 The Evolution Classic range provides an affordable reception desk that does not lack in the looks department. These desks, unlike many other reception desks are not modular, however there are a wide variety of stand alone desks that can be used for either one or two people. These desks are available in a wide range of laminate finishes including Ash, Beech, Ebony and Oak as well as a range of solid laminate colours as well. These desks also come with an acrylic upstand that is available with 3 different upstand finishes that further increases the customisable options. There is also the option of manufacturing any of these desks with your company logo or slogan on it which can instantly make it unique. By adding a logo or slogan to your desk can help boost your reception areas identity and adds a touch of professionalism to the area. 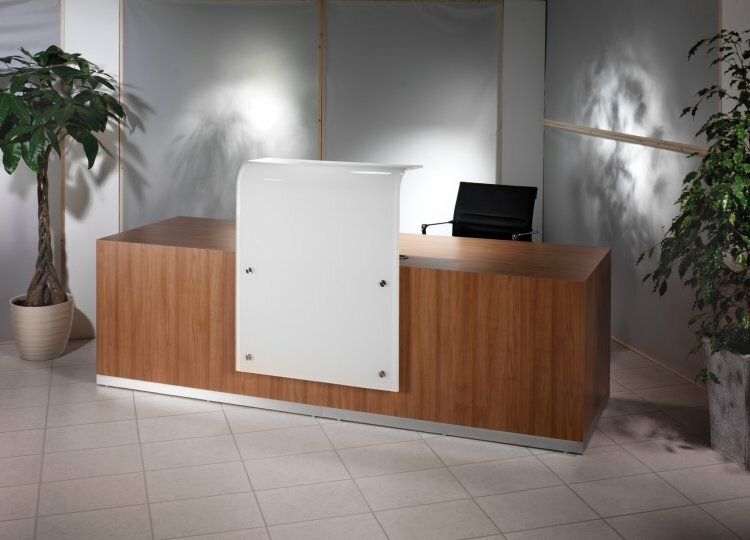 Evolution reception desks are manufactured in the UK and come with a five year factory warranty. This range also comes with a free and professional installation service. Our installation team will call you to arrange an appropriate time for delivery and installation at your convenience. The standard delivery period for this range of reception desks is 5 weeks as they are made to order, however some of the reception desks are available for an express delivery within 10 working days from order. Please call our expert sales team to find out more. As usual we support the Evolution range of reception desks with our free design and pace planning service. Our designers will visualise your reception are in 3D format so you will get a realistic impression of how your reception desk will look. Please contact our design team on 01823 663880 if you would like to take advantage of this FREE service.